You can add, remove, or modify units, and categories. The current version provides new conversion groups, additional units, and also contains the new unique feature: Unit Converter Pro allows you to create, customize, and print out conversion tables of every category. Unit Converter Pro for Windows, BlackBerry OS (5.0 and higher), Android (2.1 and higher) and Palm OS (3.5 and higher) is available. Unit Converter Pro for BlackBerry is distributed in two versions. The Lite version is freeware and has unit database that is restricted to 800 units in 20 categories. 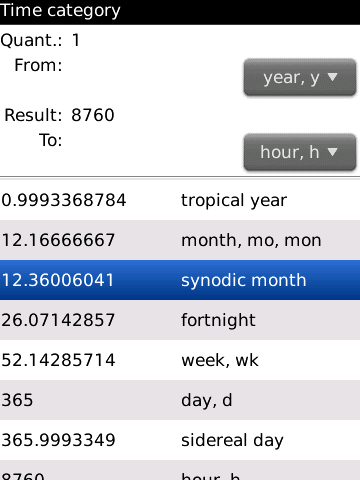 The full version is available in the BlackBerry App Store and contains the full database of units. Unit Converter Pro for Android is currently distributed as a freeware. 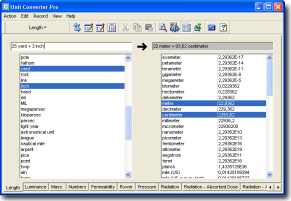 Unit Converter Pro for Palm is distributed as a freeware. Complete Spanish and German localization. Multiple sources of currency exchange rates. Version for Android is now available. Version for BlackBerry smartphones is now available. Some changes in user interface.